It is important that students develop the knowledge and skills to make informed choices about the next stages of their life after secondary school. Lauren Sharman, the Head of Careers and Higher Education, Berina Chan and Adam Cowling, our two Higher Education Counsellors, counsel students in a wide range of higher education and careers options. In the lower years, careers education is delivered mostly through the Pastoral Programme as well as some bespoke workshops intending to investigate the world of work. The team coordinate work experience for Year 11 students, and are always looking to expand the opportunities available. If you are able to support us in this work please contact the Lauren Sharman on lsharman@sis.edu.hk. Higher education guidance happens through individual and group provision in Years 11-13. The team take an active part in advising students on programme and subject options, particularly in Year 11. In Years 12 and 13 they advise students on a group and individual basis and manage applications for all the major H.E. destinations: UK, USA, Hong Kong, Canada and Australia. They are also able to help students research and apply to other tertiary systems. They advise on overseas tests such as TOEFL/IELTS and SAT/ACT. Evening meetings that focus on Higher Education are organised for the parents of students in Years 11 and 12. Lauren, Berina and Adam are supported in their work by an Administrative Assistant. The Careers Centre is located in the Diploma Centre on the Sixth Floor and is stocked with a comprehensive range of reference materials and prospectuses. The Careers Section of the VLE acts as a medium through which students can access aspects of the Careers Curriculum, search Higher Education options worldwide and receive news of upcoming events external to the school. We are lucky enough to receive a wealth of visitors representing universities and colleges from around the world. These opportunities are advertise through the VLE and the team encourages all students to attend. We would love to welcome you onto our campus! If you are interested in scheduling a visit you can either contact Lauren Sharman on lsharman@sis.edu.hk or book in via the RepVisits website. 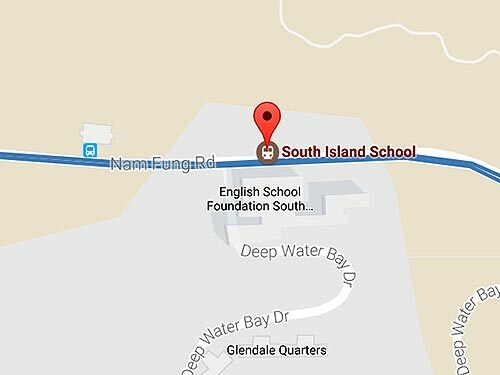 The best times to visit us to potentially meet with students are Monday, Wednesday and Thursday 10:05-10:35am or 12:35-1:15pm, Tuesdays 12:35-1:15pm, or Fridays 10:05-10:35am. You can also get our latest updates on our Facebook and Twitter pages. 2018’s Higher Education statistics show the UK retaining the top destination at 40%, while Hong Kong, our second most popular destination, saw an increase to 21% of all confirmed destinations. America-bound students have stayed at a similar level to last year, at 15%, with Canada and Australia both at 7%. We had three students take up places in Europe, two to the Netherlands and one at the fascinating DigiPen Institution of Technology Europe, in Bilbao Spain. We have 2 students pursuing applications to Japan and one to Korea. We have 8 students choosing to take a Gap year to explore work, volunteering and travel, seven students are holding deferred places at university in the UK for 2019. Two students will be undertaking military National Service. In terms of institutions Exeter (6) and Loughborough (5) are the two most popular UK universities in 2018, with Kings and Kent securing joint third place with four students going to each. In Hong Kong, we have 16 students going to the University of Hong Kong, seven to HKUST and four to the Chinese University of Hong Kong. The University of British Columbia is still the most popular destination in Canada with five of our students going there. The University of California remains popular with SIS students heading to the USA, with six students at its various campuses. New York University always receives a lot of applications from our students and this year two will matriculate there, as well as two to Rutgers. At the highly selective end, one student is heading to Columbia, one to Cornell, one to Barnard, three to UC Berkeley and one to UCLA. We have a student choosing to go to Wesleyan, a selective Liberal Arts college, as a recruited tennis athlete. We have three students going to Cambridge, one to Oxford and two to the London School of Economics. 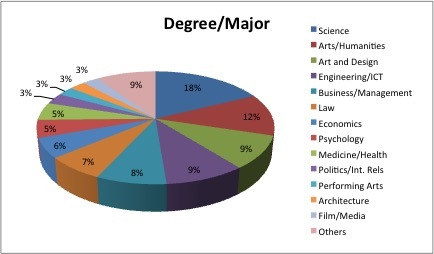 In terms of choice of degree or major, Economics, Business and Management are consistently very popular. Broad science degrees have been of particular interest to this cohort, but eight students are pursing medicine and notably six students are pursuing a computer science related course. Engineering remains consistently popular, but a firm favourite of previous years, Law, has dropped in popularity. Social Sciences remain popular, with students appreciating the breadth these courses offer. A particular favourite is Psychology, with 11 students choosing this as their major. Our last cohort of ‘Advanced Diploma’ students, all of whom are heading to the UK, are pursuing a mix of Business Management, Sports and Art/ Design courses, mirroring the ‘major’ subject they chose to pursue in their BTEC. We are looking forward to seeing where our first cohort of IBCP students will matriculate to in 2019. Our IBCP Valedictorian was a perfect candidate for this dynamic course, which not only wanted excellent academics but also highly developed soft skills. Eliana chose to defer her place so she could take a Gap year and further develop herself through a Mandarin course at CUHK and internships. Keshav very much knew his own mind and where he felt he ‘fit’ best when considering where to apply to university. He ended up in the enviable position of choosing Columbia over other US offers he received from University of Pennsylvania, Northwestern and UC Berkeley. Heidi was one of our most focused applicants during the university research process and found some really interesting and exciting ‘niche’ courses in Hong Kong to which she applied. She was given the opportunity to interview at many institutions and ended up choosing a course that would allow her to gain skills very much linked to the real world. Belinda was genuinely torn between the fantastic range of offers she received in the UK and Hong Kong and was still researching and carefully considering all factors when she got her results. She was highly in demand in both countries and received not only offers from Cambridge and the London School of Economics in the UK, but also the University of Hong Kong and the highly competitive Global Business course at HKUST. This course describes itself as ‘designed for capable and highly motivated students who aspire to be responsible leaders with global perspective, cultural sensitivity, compassion in social causes, sound critical thinking and humanity’, all things we would whole heartedly have said Belinda was already demonstrating. She eventually chose to matriculate to Christ’s College, Cambridge. Rio had been undertaking Ballet at high level for many years before contemplating her higher education next steps. Her long hours of practice and multitude of performances for the Hong Kong Youth Ballet company, whilst also achieving on the IB Diploma, allowed her to secure a place at the prestigious English National Ballet School. She is hoping to pursue a career in Ballet. 2017’s Higher Education statistics show the UK retaining the top destination with a slight increase to 42%, while Hong Kong has only just kept the second spot with a significant decrease to 16% of all confirmed destinations. America-bound students have decreased significantly from last year, dropping to 15% with Canada chasing behind it at 10%. One has to wonder if the current political climate has been involved in this drop from last year. We had six students take up places in Europe, four of which were in the Netherlands. Others have taken up places in Korea, Japan and China, with 11 students currently preparing applications to Australia and New Zealand. We had seven students choose to take a Gap year to explore work and travel, before embarking on their university studies in 2018. In terms of institutions, Warwick and Exeter (6 at each) and UCL (5) clinched the first three places in the UK, with three students at four other universities, including Cambridge, Bristol and Leeds. Though the University of British Columbia is still the most popular destination in Canada with eight of our students going there, five students are heading to the University of Toronto. The University of California remains popular with SIS students heading to the USA, with six students at its various campuses. At the highly selective end, one student is heading to Brown, one to Northwestern, two to UC Berkeley and one to UCLA. In addition to the three students securing places at Cambridge, one student is headed to Oxford. On a more local level, 18 students will matriculate at HKU this September, two of which have elected to attend HKU Space, their community college. In terms of choice of degree or major, Economics, Business and Management are very popular, as is the field of Art and Design. Sciences have captured the attention of this cohort, understanding the transferable nature of the skills developed on this kind of course. Engineering remains consistently popular, but a firm favourite of previous years, Psychology, has dropped in popularity. Our Advanced Diploma students, most of whom head for the UK, have once again surpassed their IB counterparts by securing 100% of their ‘Firm’ offers in UCAS and are pursuing a mix of Business Management, Sports and Art/ Design courses, mirroring the ‘major’ subject they chose to pursue in their BTEC. Liana was delightful to work with because she had invested a significant amount of time into really exploring the idea of ‘fit’; understanding what type of learning environment and course might suit her best. As such, Liana’s application to Brown, which has an admit rate of 8.3% met a warm reception. They look for students who demonstrate ‘informed activism’ and Liana’s roles in and out of school allowed her to demonstrate this fit. Both Henry and Raphaelle demonstrated the foresight to consider alternative paths to success when looking at the competitive arena of Hong Kong Higher Education. By undertaking a course at the University of Hong Kong’s community college, HKU Space, they are able to secure a place to continue their education which will allow them to progress on to the last two years of a degree either at HKU or anywhere else they choose. Thomas had the advantage of being both very well qualified, an excellent record of service work, and was also a star baseball player. Subsequently he was able to secure a place at the sought after Northwestern via Early Decision, which can be an extra competitive pool. Angela’s love of food was compelling in her application to her list of schools, and her essay about her love of making dumplings with her mother made her counsellor hungry every time they read it! Her BTEC allowed her to pursue her passion, so it was no surprise she was offered a number of places, and finally chose to take up her spot at this dynamic institution. With Sam’s huge personality it made a lot of sense for him to use his wonderfully developed soft skills to secure a place at this highly reputable and cost effective option in the Netherlands. Here he will get a rigorous Business education and an impressive amount of work experience, guaranteeing him employment in the future. 2016’s Higher Education statistics show UK numbers dipping to 40%, while Hong Kong has regained second spot with a significant increase to 24% of all confirmed destinations. Though N. America-bound students have stayed steady at 28%, a greater proportion of these are now heading for Canada rather than the USA than was previously the case. Others have taken up places in Korea, Switzerland, the Netherlands and India while a small number are currently preparing applications to Australia and New Zealand. In terms of institutions, Bath (6), Exeter (5) and York (4) clinched the first three places in the UK, with 3 apiece at 6 other universities, including Oxford, Imperial and Durham. Though UBC is still the most popular destination in Canada, 6 students are heading to Waterloo: a favourite recruiting ground for Bill Gates and many others in the IT industry. Northeastern (3) remains popular with SIS students heading to the USA, as does the University of California with 5 students at its various campuses. At the highly selective end, one student is heading to Yale, two to U Penn, one to Cornell and two to UC Berkeley. On a more local level, no less than 20 students will matriculate at HKU this September. In terms of choice of degree or major, Psychology has rebounded as a popular choice, as has the field of Art and Design. Put together, Science, Engineering and Medicine/Health account for 25% of the whole cohort, as do Business and Economics combined. A healthy number are pursuing Politics and/or International Relations reflecting the breadth of their school and IB experience. Our Advanced Diploma students, most of whom head for the UK, have once again surpassed their IB counterparts by securing 100% of their ‘Firm’ offers in UCAS and are pursuing a mix of Business Management, Sports and Hotel/Hospitality courses. 2015’s Higher Education destinations show UK numbers holding up at just below 50%, while N. America has rebounded to represent 28% of confirmed places overall. Hong Kong numbers have reduced somewhat to 15% of the cohort. Others have taken up places in Singapore, Korea, the Netherlands and India while a small number are currently preparing applications to Australia and New Zealand. Unlike 2014, the UK stole the show in terms of highly selective universities with 5 students going on to Cambridge or Oxford, although we also sent students to U Penn (2), Williams and Johns Hopkins. In terms of institutions, King’s and UCL clinched joint first place in the UK with 6 of our graduates each; followed by Nottingham and Exeter at 4 apiece. Strengthening trends from last year, 5 USA-bound graduates will enroll at NYU and 8 students will attend varied campuses of the University of California. In Canada, UBC rebounded from last year’s low of 2 and they will receive 7 SIS graduates this time around. 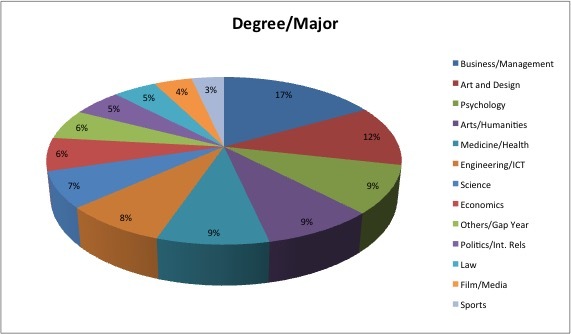 In terms of choice of degree or major, Science in general and Biomedical Sciences in particular have shown up strongly in the class of 2015’s preferences. While one can recognise areas such as Accounting, Psychology and Sports where numbers have decreased, it is unwise to try to read anything into comparisons of cohorts of students that are each, after all, unique collections of individuals. What is gratifying, in our opinion, is the wide range and variety of options pursued: from Speech Therapy to Yatch Design and Production, to Landscape Architecture, to the Undeclared option for the USA. Our Advanced Diploma students have, once again, shown up strongly amongst the significant numbers pursuing Art, Fashion, Film and Business but have also secured places to study majors in Nutrition, Education and Music Events Management. While most are headed to the UK, others are bound for the USA, Canada and Hong Kong. 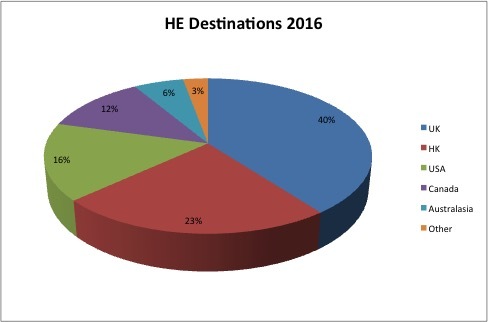 2014’s Higher Education destinations show UK numbers not only holding up but increasing to 50% for the first time since 2009. 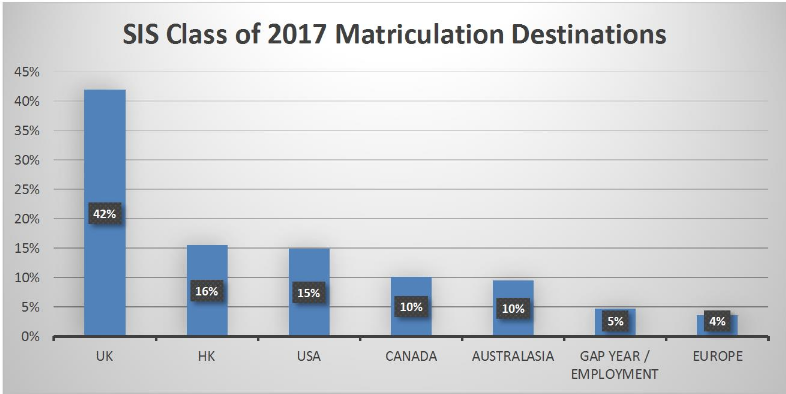 While Hong Kong once again took up just over 20% of final places, the USA fell back to third place at under 15%, though it stole the show in terms of highly selective universities with our graduates now embarking upon their studies at Harvard, Stanford, U Penn, Cornell and Northwestern. Canada also fell to around 7%, Australia at 5% with the remainder of confirmed places in Korea, Japan, and the Netherlands. Though the UK continues to present challenges to our IB candidates in the form of tough and specific entrance requirements, 85% or our UK-bound students are attending their ‘Firm’ choice and, most interestingly this year, a third of these candidates did not meet the full conditions of their offer but were still accepted (this often involves a stressful wait until the ‘A’ level results come out in August). In contrast, all Advanced Diploma candidates achieved their ‘Firm’ choice and met the full conditions of their offer. In terms of institutions, Edinburgh clinched first place in the UK (barring a ‘yes’ vote in the referendum) with 6 of our graduates; Loughborough is second at 5 and Kent, York and Warwick share third place with 4 apiece. Globally, HKU is way ahead with 15 SIS graduates, taking back first place from UBC who have dropped from 10 to 2 since last year. Three USA-bound graduates will meanwhile enroll at NYU. In terms of choice of choice of degree course, fields such as Business (23), Law (13) and Psychology (13) have held strong. Growth has appeared in the numbers pursuing Architecture or Building Surveying (8) and Accounting (5); while in the medical field, Osteopathy, Dentistry, Physiotherapy, Veterinary Science and Medical Sciences added to those pursuing Medicine bring numbers well into double figures. With growth of those pursuing creative options in the BTEC Diploma, half of those pursuing Art/Design/Film/Media at tertiary level are Advanced Diploma students including two heading to the USA. This year’s Higher Education destinations show some interesting trends with, on the one hand, a remarkable level of consistency for the UK and, on the other, a surprising reversal of the recent surge in numbers staying in Hong Kong. Our UK numbers (62) and percentage (37%) are exactly the same as the Class of 2012, while the USA has regained 2nd place with 27 students heading in that direction and, if we add an increased number for Canada (19), the overall percentage for North America is 28%. The reduction in numbers heading to Hong Kong universities from over 20% in 2012 to 14% this year, may be partly accounted for by the fact that the universities had only one cohort to fill, this year (2012 saw the double cohort transition). Australasia has stayed steady at around 8% and our other destinations include Switzerland, Korea, Japan, India, Taiwan and the Netherlands. Though the UK continues to present challenges to our IB candidates in the form of tough and specific entrance requirements and though our IB results were less strong than the extraordinary Class of 2012, 46 or our 62 UK-bound students are attending their ‘Firm’ Choice (or higher through Adjustment): that percentage being the same for both IB and AD candidates. In terms of institutions, the UK shows a fairly even spread with no clear favourite: Manchester, Edinburgh, Bristol and Oxford Brookes claiming 4 of our graduates apiece. The clear global favourite is UBC in Canada with 10 SIS graduates heading there: it has taken over first place from HKU who with 8 students is even trailing behind HKUST with 9. USA-destined applicants have made a distinct shift towards the ‘Public Ivies’ with 3 attending the University of Wisconsin (Madison) including our golf scholar, Michelle Cheung, 3 to UCLA, 1 to UC Berkeley and 2 to UC San Diego. Indeed, there is a strong California bias with 11 out of 27 students overall. Having said that we also have 3 students who will attend what is generally regarded as the top Art school in the USA, Rhode Island Institute of Design. There haven’t been any striking changes in choice of degree course or major with this year group. Psychology (14) continues to grow in popularity, while Business (20), Economics (11), Science (19), Engineering (10), Law (11) and Art /Design (10) retain their traditional levels of interest. The Advanced Diploma programme has made Sport (8) a growth area and 4 students are going into the field of Hotel and Hospitality Management. Overall, the Higher Education destinations of our students in 2012 reflects the pattern of recent years, though with a slight drop in the proportion heading to the UK to 37%, with numbers for the USA and Hong Kong staying strong at around 19/20% each. Canada and Australasia account for around 7% each, while the remaining 10% include students heading to Japan, Korea and the PRC, as well as those pursuing gap years or national service. 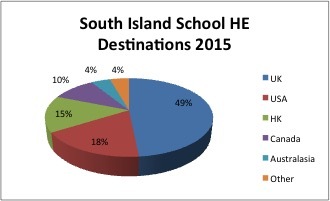 In terms of institutions, HKU led the way once again with 19 SIS students matriculating next month but there is a fairly even spread elsewhere. In the UK, Nottingham (5), King’s College, London (4) and UCL (4) proved popular and LSE, Edinburgh and Bournemouth picked up 3 SIS graduates apiece; as did UCLA and Northeastern in the USA. At the very selective end of the spectrum, our high IB achievers are pursuing the likes of Natural Sciences at Cambridge, Mathematics at Yale, Social Sciences at Brown and Medicine at HKU. Once again, all applicants for Medicine were successful in gaining a place and in terms of UCAS applications overall, 85% applicants achieved their ‘Firm’ (first choice) offer. Our Advanced Diploma graduates are set to pursue degrees in area such as Sports Management, Business, Fashion, Early Childhood Studies, Events Management and Hotel Management, mainly in the UK but also in the USA and Australia. While traditional favourites such as Business, Psychology and Law remain popular as degree choices, it is pleasing to see that over 20% of our graduates have opted for degrees in some field of Science or Engineering. Seven of our graduates are going on to pursue Architecture and Environmental Science/Studies seems to be gaining a strong interest too. This academic year confirmed once again that the picture is truly global when it comes to the Higher Education aspirations and destinations of our senior students. The UK still provided the largest group, at 40% of the total number: the USA followed with 16%, Hong Kong 15%, and Canada and Australasia (still to apply) both around the 8% mark. The remaining 14% included Japan, Korea, Ireland, Switzerland, Singapore, the Netherlands, the Philippines and Gap Years that also include military service in Israel and Singapore. In the UK, the University of Nottingham was the most popular UK destination with 8 students matriculating this month and Manchester, York and Warwick not far behind at 5 apiece. 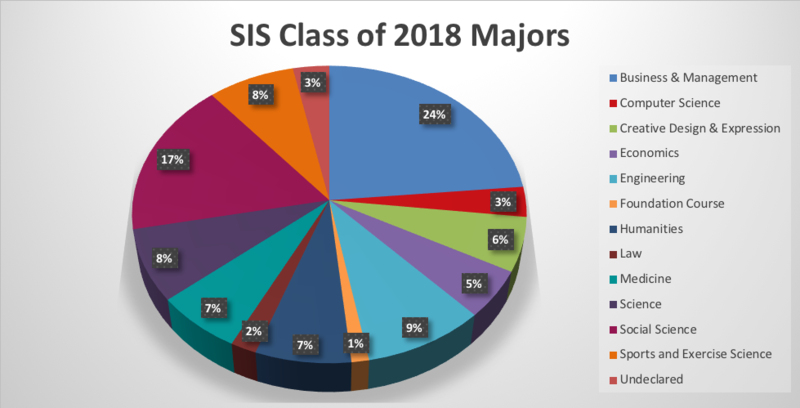 In the USA, Northeastern (3), Boston U (2) and the University of Michigan (2) proved most popular, while in Canada the University of Toronto welcomes 5 SIS graduates. HKU is once again, the biggest receiver of our talent at 11 students. At the very selective end of the spectrum, our high IB achievers are reading the likes of Law at Cambridge, Music at the Royal College of Music in London, Engineering at Caltech, Actuarial Science at LSE, Engineering at Imperial, Commerce at Queens and Medicine at HKU, Edinburgh and Dundee. In fact, all applicants for Medicine were successful in gaining a place this academic year. Once again, of the UK applicants, over 80% secured their ‘Firm’ offer and 3 others secured even ‘better’ places though the ‘Adjustment’ system. Our first cohort of graduates with a BTEC qualification succeeded not only in gaining places in the UK in the fields of Business , Sports and Fashion but one will study at Loyola Marymount University in California , one at the Ontario College of Art and Design in Toronto and one will take up a degree in Podiatry in the UK. Business and Economics remain as popular as ever as a course choice, with significant numbers also going into Art and Design, Architecture, Engineering, Law, Medicine, Psychology and the Social Sciences. This academic year confirmed once again that the picture is truly global when it comes to the Higher Education aspirations and destinations of our senior students. While the UK still provided the largest number, as a percentage it only represented 36% of the total number, as opposed to hovering around the 50% mark in recent years. The USA followed with 23%, Hong Kong 14% and Canada and Australasia (still to apply) both at the 10% mark. The remaining 7% represents Japan, Switzerland, the Czech Republic and Gap Years that also include military service in Israel and Singapore. In terms of institutions, things were evenly spread in the UK this year, with the University of Sheffield emerging as the one with most entrants (5). The same was true of Canada with 3 students apiece at UBC, Toronto, McGill and Western Ontario while, in the USA, New York University edged in front of UC Berkeley by 6 to 4. The biggest numbers by institution, however, were achieved by HKU and HKUST with 10 and 8 respectively. Business remains as popular as ever as a course choice, with significant numbers also going into Art and Design, Hotel Management, Film Production and Medicine. 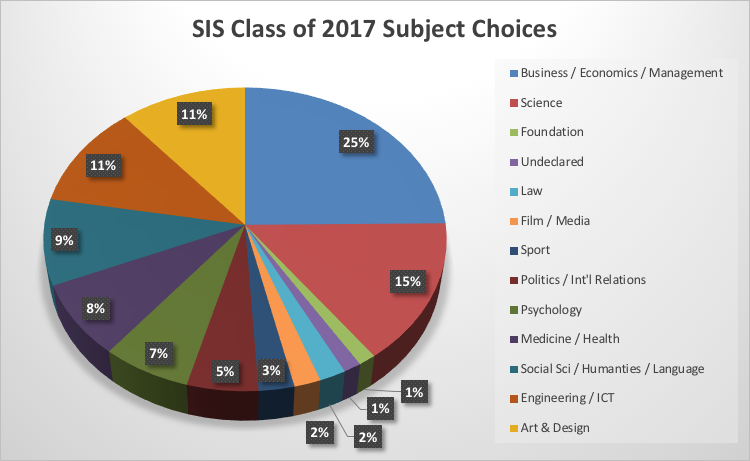 Graduates from SIS’s first IB cohort have now secured university places in all four corners of the globe (if a sphere can have corners), with the exception of Australia for which applications are only now underway. As in the recent past, the UK accounts for approximately half this number; the USA just less than a quarter and, as we expected, Hong Kong exceeding 10% . Among the most selective destinations this year were Cambridge, Harvard, Stanford, Cornell and UPenn. Exeter and King’s College London proved the most popular UK destinations with NYU and the University of Toronto taking the top spots in North America. 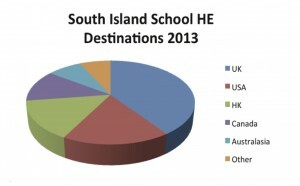 The most popular destination worldwide, however, was HKU with no less than 8 South Island students matriculating this month. In terms of degree choice or majors, these were refreshingly varied compared to some previous years, with a noticeable growth in areas such as Political Science and Film Production. It was also pleasing to see an open-minded approach to applications resulting in students joining a top women’s liberal arts college (Barnard), an Italian Fashion School (Istituto Europeo di Design) and one of the top colleges in the beautiful eastern region of Canada (St. Francis Xavier in Nova Scotia).